For weeks leading up to the November 2008 election, the Minuteman Political Action Committee proclaimed that it was furiously advancing "2008 Project PushBack," described as an all-out effort to reelect 20 members of Congress who support immigration crackdowns and to elect newcomers who back the Minuteman agenda. "To accomplish our goals, we'll need to raise and distribute, with direct and indirect donations, up to $3.5 million," wrote the committee's executive director, Brett Farley, in a message to supporters that's posted on the Minuteman PAC's website. But while the Minuteman PAC spent $1.7 million during the last election cycle (as of Nov. 24), less than 9 cents of every dollar went to help candidates — either directly through contributions or indirectly through advertisements and mailings supporting or opposing specific candidates. By contrast, nine similar PACs spent, on average, nearly four times as much —about 34 cents of every dollar — on contributions to federal campaigns and on materials calling for the election or defeat of particular candidates. The Minuteman PAC was established in December 2005 as one of two PACs that form the political action arm of the Minuteman Civil Defense Corps (MCDC), a nativist extremist group whose members conduct armed patrols of the border. MCDC founder and president Chris Simcox has been widely denounced by former followers within the anti-immigration movement for failing to complete a promised border fence and for allegedly selling out his organization to a shadowy and incestuous network of professional right-wing fundraisers. In May 2007, Simcox expelled three MCDC national officers, one regional leader, and 14 of 27 state chapter leaders after they raised questions about his financial accountability. Stacey O'Connell, one of the Minuteman chapter leaders ousted by Simcox, sent him an Oct. 19 E-mail that he mass copied to MCDC supporters. "Your MM PAC gets away with only giving money to 2 candidates this year while you run around pretending to do something for the movement, and keeping the cash coming," he wrote. "Simcox — you sold the movement out in April 05 [when MCDC was founded], and you've been cheating volunteers ever since." Simcox initially declined to comment for this story. But after the Intelligence Report contacted Farley late last year, Simcox issued a December news release attacking the Southern Poverty Law Center (SPLC), which publishes the magazine, saying: "The SPLC and leftist groups like it have continued to assail Minuteman PAC for its leading efforts to secure the borders and promote a positive culture of national security and American virtue." In fact, the Minuteman PAC first came under scrutiny not by "leftist groups," but by the ultraconservative Washington Times, which published an article in June 2007 revealing that political candidates had received only a tiny fraction of the $300,000 the PAC raised during the first three months of that year. 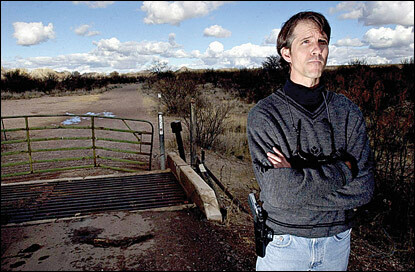 Chris Simcox, leader of the Minuteman Civil Defense Corps and a proponent of armed civilian border patrols, has himself come under attack for alleged financial improprieties. Many of the allegations of corruption within the MCDC have centered on Simcox's failure to account for more than $600,000 the MCDC reported raising in 2006 for an "Israeli-style" border fence that has yet to be constructed. But the most recent filings with the Federal Election Commission (FEC) — where PACs, private groups that raise money to elect or defeat political candidates, are required to detail their spending — raise anew questions about the Minuteman PAC's promised backing of political candidates. Despite the long list of congressional candidates to which it promised support, the Minuteman PAC gave direct contributions to only two during the 2007-08 election cycle: $10,000 each to California Republican Duncan Hunter, who successfully ran for his father's seat in the U.S. House of Representatives, and Bill Greene, a Georgia Republican who lost a bid for Congress in a special election held last year. (Greene later refunded $5,000 after failing to advance to a run-off election). None of the 20 congressional incumbents described on the Minuteman PAC website as "urgently need[ing] our help" received any money. In addition to that $20,000 in direct contributions, the Minuteman PAC spent $127,213 on mailings and advertisements that supported or opposed specific candidates — although most of that money went to anti-Barack Obama mailings rather than to help the candidates targeted by "Operation Pushback." Only $11,600 was spent on direct mail and telephone communications supporting congressional candidates. The beneficiaries were Lou Barletta, the Hazelton, Pa., mayor whose sweeping ordinance targeting undocumented immigrants was ruled unconstitutional, and John Stone, a Georgia Republican. Hazelton, Pa., Mayor Lou Barletta, a nativist movement icon since drafting draconian anti-immigration legislation, got $10,920 from the Minuteman PAC, more than any other candidate. Aside from $147,213 given directly to candidates or spent on independent efforts to help their campaigns, the Minuteman PAC allocated most of the money it spent — about $1.5 million — to the FEC category of "operating expenses." The FEC includes under operating expenses such costs as fundraising, promotion of the PAC's mission, and staff salaries. In its news release, the Minuteman PAC claimed that more than 85% of its expenses in that category, or $1.3 million, went toward "education," while just $232,292 went for fundraising and administration. Simcox also defended his PAC's spending pattern in a posting on his blog last October, arguing that "donor education" and expanding the donor pool — expenses listed under operating expenses — are important goals. "A political action committee is not necessarily specifically in business to give money to candidates," he wrote, "and this is especially not the priority if the limited contributions allowable under federal law cannot change the outcome of the election." But Simcox had sounded a different note on the Minuteman website, where he stated: "The next step is to start electing a Congress that will take seriously the need for genuine border security by our government! … Going into the 2008 elections, we urgently need to replenish our war chest for key contests across the country." It's true that donor education and recruitment are considered perfectly legitimate ways of spending PAC money, and they are categorized, for FEC purposes, as operating expenses. An FEC spokesman said federal law does not require PACs to donate a certain amount or percentage of the money they spend to candidates. The spokesman also pointed out that the Minuteman PAC belongs to a class of "non-connected" PACs that have higher operating expenses because they're not legally connected to another organization that would help defray overhead costs. But it is not true that just $232,000 of the Minuteman PAC's operating expenses went to fundraising and administration. Just a few of the non-education expenses listed in that category —$174,890 on donation processing, or "caging," $53,500 on accounting, $11,685 on bank charges, and $8,000 in legal fees — amount to more than that. Two political campaign experts contacted by the Intelligence Report — Gary Jacobson, a professor of political science at the University of California, San Diego, and Paul Herrnson, a professor in the department of government and politics at the University of Maryland — said the Minuteman PAC's spending patterns were unusual. "If I were a supporter, I'd be disappointed," said Herrnson. Another aspect of the Minuteman PAC's spending that has drawn angry criticism from former allies is its practice of paying friends and allies for a wide variety of services — what many see as a form of self-dealing. In fact, FEC spokesman Bob Biersack told the Intelligence Report that there's no law against political action committees paying even their own officers for services, so long as they're being paid for work that's actually performed and the payment is consistent with typical market rates. In its news release, the Minuteman PAC made a related point: "Conservative organizations hire trusted conservative vendors. Many are referred by other conservative organizations." Nearly $175,000 to American Caging in Strafford, Texas, for services that involve "opening mail containing contributions to nonprofit organizations, sorting the contents, counting the funds, and depositing the funds in the nonprofit organization's bank account," according to the company's website. The president of American Caging is Maureen Otis, who is also secretary of the Minuteman Foundation Inc., an MCDC subsidiary formed to raise money for the scandal-ridden "Israeli-style" fence project. An additional $8,000 went to Otis for unspecified legal services. $42,050 to ELA Data Services in Seal Beach, Calif., for Internet services and website design. Though it's not registered as a business in California and doesn't appear to have a website or telephone listing, the company's post office box address is also that of Minuteman PAC treasurer Eldon L. Alexander, whose initials, of course, are ELA, just like the name of the company. Alexander declined to comment when contacted for this story. $53,500 to Constantine Financial Services in Reston, Va., for accounting services. Until about two years ago, William Constantine, who runs Constantine Financial Services, served as treasurer of the Declaration Alliance, a right-wing advocacy group that was started by perennial fringe presidential candidate Alan Keyes in 1996. The Declaration Alliance website identifies the MCDC as a "project" of the Declaration Alliance. Constantine also served as treasurer of the Declaration Alliance Minuteman Civil Defense Corps PAC and the Declaration Alliance PAC, both separate, smaller PACs with ties to the MCDC, until early 2007. $31,600 to Politechs in Alexandria, Va., for public relations and fundraising work. Politechs is headed by Mary Parker Lewis, who's identified on tax forms as treasurer of both the Minuteman Foundation and the Declaration Alliance. Lewis is also the executive director of the Declaration Foundation, a sister organization to the Declaration Alliance. In 2006, the state of Pennsylvania ordered the Declaration Foundation to pay a $6,500 fine for making a false statement on legal forms. The statement claimed that none of the foundation's officers were related to anyone it had hired to provide goods or services. In fact, the Declaration Foundation had paid $10,000 in consulting fees to Politechs, Lewis' company, and over $63,000 in "consulting fees" directly to the Declaration Foundation's president. Nearly $2,000 to Secured Borders Consulting in Scottsdale, Ariz., to work on a border security project. The director of Secured Borders Consulting is Simcox, who is officially identified as the honorary chairman of Minuteman PAC. With the exception of Constantine, none of the business owners paid by the Minuteman PAC responded to phone calls or E-mails seeking comment. Constantine said he doesn't see any problem with hiring people connected to the Minuteman group to also provide services for the PAC. What matters is their attitude toward immigration, he said. "You're not going to hire Hillary Clinton's treasurer to be treasurer of the Minuteman Civil Defense Corps," he said. "You don't go to somebody who believes in amnesty for millions of illegal aliens to run your books. It just doesn't make any sense." The two smaller political action committees linked to MCDC — the Minuteman Civil Defense Corps PAC and the Declaration Alliance PAC — also spend heavily with businesses that have ties to Minuteman and Declaration Alliance officials. For instance, in addition to the payments they received from the Minuteman PAC, American Caging and Constantine Financial Services each collected about $50,000 from the two smaller PACs in the last election cycle. And Politechs received more than $34,000 from the smaller PACs for public relations and fundraising work. As it happens, Politechs' president Mary Parker Lewis is treasurer of both the Minuteman Civil Defense Corps PAC and the Declaration Alliance PAC, as well as the Minuteman Foundation and the Declaration Alliance. Lewis didn't respond to a phone message seeking comment. None of this sits well with Simcox's movement critics. Former Minuteman chapter leader O'Connell, in an Oct. 5 E-mail to Arizona political candidates for state office, sarcastically insinuated that the Minuteman PAC wasn't doing enough to help candidates. "With all that money sitting around collecting interest from folks who donated to help enforce immigration laws, I'm sure you wonderful candidates could put it to use in these last few weeks of our Presidential Elections," he wrote. Four days later, Simcox fired back on his blog at O'Connell, saying the Minuteman PAC is prohibited from supporting state-level candidates because it's a federally registered PAC. "Minuteman federal PACs cannot contribute to or work in any way to directly support candidates running for state level office," he wrote. Federal PACs are in fact allowed to give money to state candidates, though all such contributions are subject to state election laws, said Biersack, the FEC spokesman. This information is clearly explained in an FEC guide for PACs. Meanwhile, O'Connell is still trying to convince MCDC and Minuteman PAC donors they're being duped. "Minutemen are no longer the transparent, grassroots volunteers they started out as," he wrote in another mass E-mail last fall. "You have been tools in raising money, and perpetuating fraud, since the summer of '05."